Posted October 5th, 2013 .
oh dear ha ha ha. Oh the belly ache that’s going to follow… Woof! well how did she get to it?????? I would forgive her anything – especially my error! It’s your moms fault! She knew you had a weakness for sweets. Stick with that excuse. Hey, Meeka, I hope you don’t have too much gastric distress because of this. You look a little thin, so maybe you were just real hungry! Yum Yum. Good! You should have known not to go out without feeding me first. So I helped myself. I had a Great Dane that did that but it was an Apple Pie. My littlest basenji opened the refrigerator once and ate at least 1/4 of a chocolate New York Style cheesecake. She didn’t get sick or have any adverse affects (the chocolate had me worried, it was Ghirardelli cocoa) and wasn’t sorry one bit. In fact, anytime I make a cheesecake she stands around waiting for her share! Wow! Someones human will be on emergency bathroom watch for the next few nights! 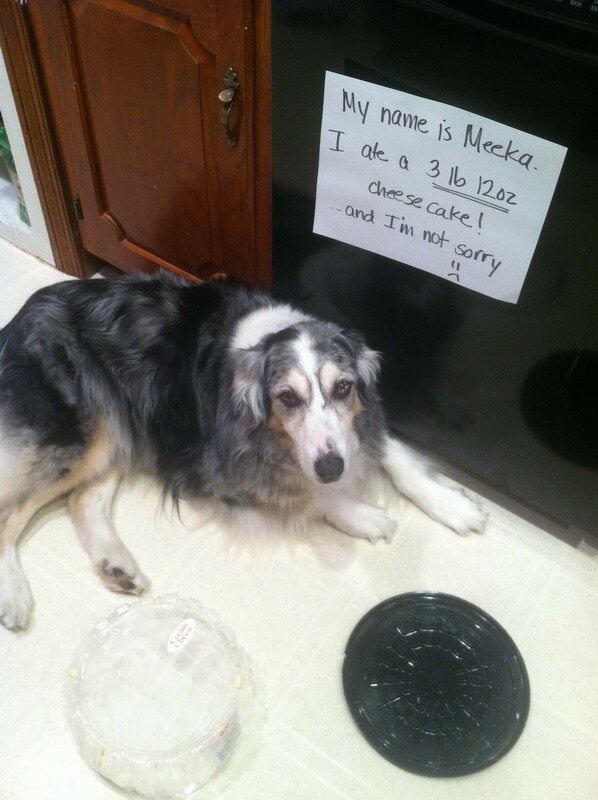 Meeka knows that cheese is one of the food groups! If Meeka is anything like my aussie she has a stomach of steel. Plus Annie when she does something wrong she just looks at me and smiles and has no remorse at all.